Well, the holidays are behind us and I hope you all had a great holiday season. Winter is in full swing, at least here in Indiana, with snow falling as I write this post. Soon it will be time for some healthy doses of vitamin D from the midwest sun. Spring break isn’t too far away and the AHRA Spring Design Team is hard at work creating a great Spring Conference for us in warm and sunny San Antonio, Texas. As many of you know there is a large military presence in the area, and the AHRA will be using this opportunity to do something special for our active military Imaging professionals there. More to come on these efforts. AHRA CEO Dan Kelsey is doing an excellent job in his transition. He is bringing fresh ideas to the table with every conversation I have with him. He is asking a lot of questions and truly asking your Board of Directors to dig deeper and push themselves. Dan spends time with each AHRA staff member to assess their needs and discover the incredible work they do every day as well. I am amazed sometimes how challenging and difficult this leadership stuff can be. We get pushed to do more with less or to meet new productivity measures all in the midst of working with our respective staff to address their needs, our patient’s needs, as well as those of our Radiologist and referring practitioners. I am very lucky to work with a fantastic group of directors from other departments that work together to find solutions to the many challenges I face. These challenges require a group effort to help determine cost saving measures while at the same time grow our volumes… I have to call that an oxymoron! Sometimes I don’t see how those two things can ever work together. How many of you have a group of fellow AHRA leaders on speed dial? I sure do, and I’m sure when they see my 812 Indiana area code they just stare at the phone. Lucky for me, most of the time they pick up and for 10 minutes or so, we solve the problems of the Imaging world. There is nothing like it. For example, I was recently in a meeting with other leaders discussing breast imaging and I decided to call my friend Terry Bucknall for advice. Well, she just digs right in and provides a wealth of knowledge. You may ask why I am sharing this? How can you explain the “value” one receives from AHRA membership? This is a perfect example. To me our networking aspect is invaluable; priceless! Please send me an email to share what you feel makes your AHRA membership valuable. 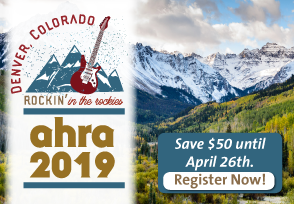 Now my challenge to all of you this month is to not get in a winter funk, but to use this time to provide value to your AHRA peers…share an experience or best practice by writing an article, answering a call for presentations or simply posting on our forum! Great article Bill! Our AHRA family is always there for each other, even when we compete in the same community.